Rugby jerseys, shorts, socks | Bison Sportswear. 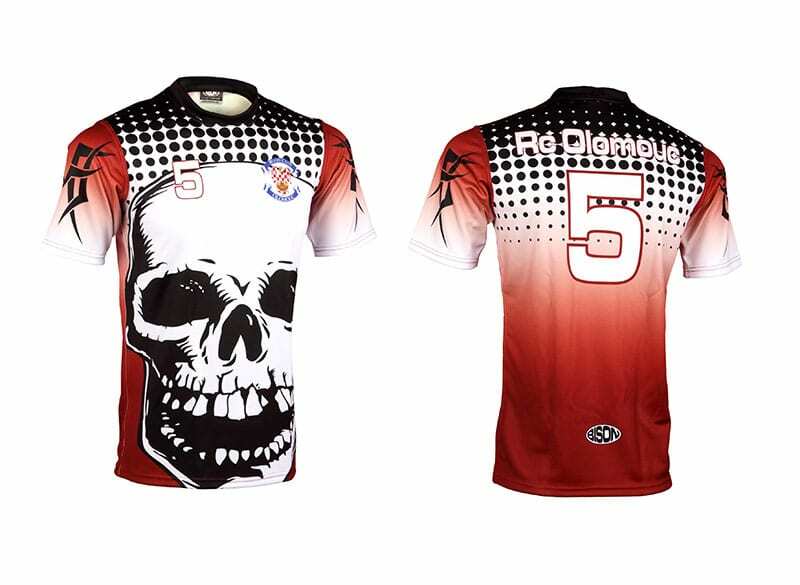 Rugby, just as the word sounds, is not a sport for “ladies.” Whether you are a fearless female rugby player, or a burly rugby player, our jerseys of special material will give you the necessary comfort during your play. 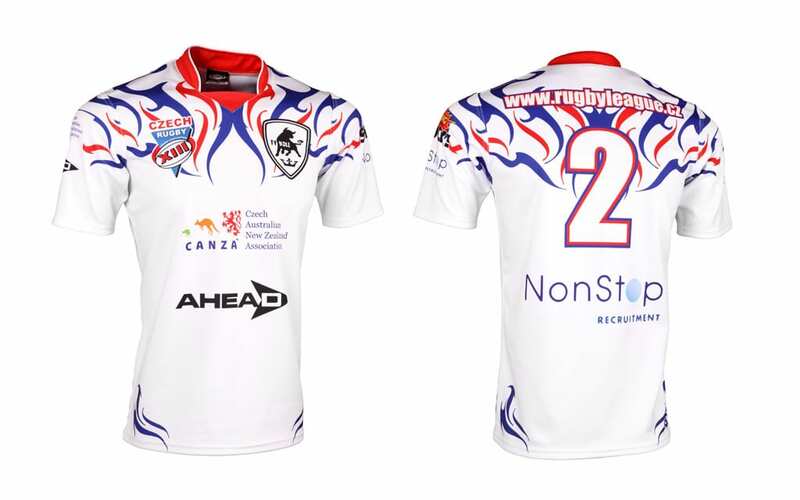 Rugby jerseys are manufactured from Span 300 gr. material that is produced in the European Union. It is a very durable and comfortable material. The great advantage is also its big elasticity, thanks to which the jerseys of Span 300 gr. material perfectly copy the athlete’s body. Simply the jerseys look good, they have an increased compression ability, all seams are double quilted with a special stitch. We do not leave anything to chance. 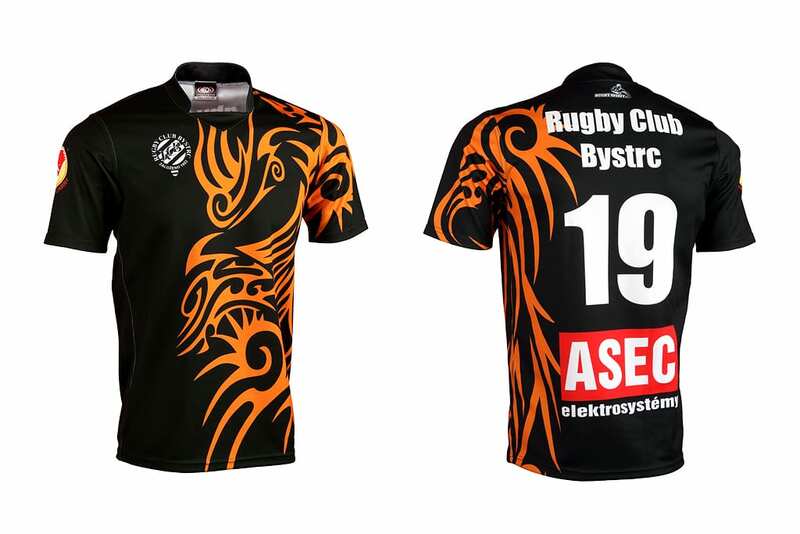 The RC Dragon Brno club participated in the rugby jerseys development. The size can be determined using our size tables. The basic information on the price can be found in the price list. where the main requirement is strength. All seams are double quilted by a special stitch using two-core threads. The basic design of shorts has an elastic bands and drawstring. 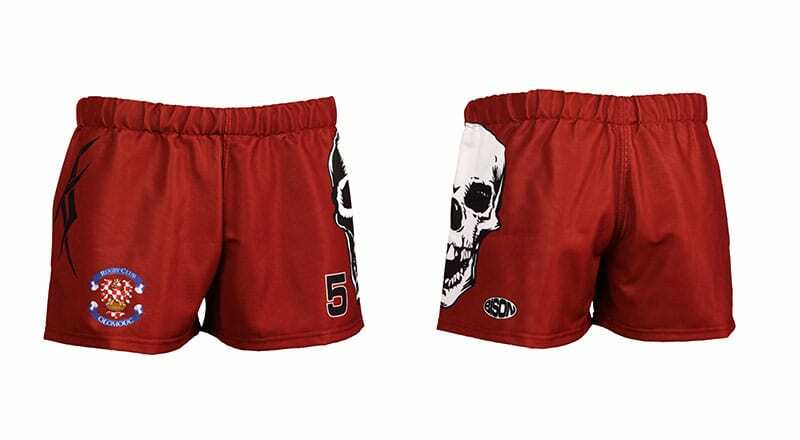 Rugby shorts are tested in extreme stress in league clubs. More information about materials can be found here. The size can be determined using our size tables. And the price? Basic information can be found in price list. Rugby socks are not just “for show” but their main function is to effectively protect the rugby player’s calves as well as women rugby players from unpleasant grazes and pollution. The socks are comfortable, from a comfortable material and it is pleasant to wear them. We will be glad to provide you with highly elastic high quality classic socks with stirrup loop at bottom that will ensure a perfect fixation of the pad on the leg. The socks are reinforced on the brim and at the ankle with quality knit. We will deliver the sock to you in various color combinations according to the color swatch and your wishes. The basic material composition of football socks is 95% polypropylene, 5% elastane. We supply socks in different sizes, ranging from the smallest for children up to adult sizes. Basic information about price can be found in the price list. We offer you the top professional football socks with maximum fixation. The football sock is manufactured from a finely densely knitted polypropylene, which provides a very comfortable wearing. The calf part contains a specially reinforced ventilation area to increase comfort and leg ventilation. A fixation zone for perfect fit on the leg is also provided in the sock. The foot sole of the sock is made from terry thus creating a comfortable environment for foot sole. This design also prevents twisting the football socks to the side. Excellent quality design of the football sock is designed for the most demanding customers. We will deliver the sock to you in various color combinations according to the color swatch and your wishes. The basic material composition of football socks is 85% polypropylene, 10% cotton and 5% elastane. The socks are delivered in different sizes, standardly: 3-4, 5-7, 8-10, 11-12. Basic information about the price can be found in the price list. Pokud si nevyberete žádný model dresu z naší nabídky, nebo požadujete dresy v originálním designu,můžeme v našem grafickém studiu společně s vámi vytvořit dresy podle vašich představ. Příprava grafického návrhu je zdarma. Samostatná výroba se vždy uskuteční až po odsouhlasení vzorků nebo tiskových náhledů. V případě ztráty nebo zničení vašich současných dresů vám rádi zkompletujeme neúplné sady zhotovením podobných dresů tak, abyste i nadále mohli tyto dresy používat.